Ryu So-yeon, world No. 1 in women's golf, has been shortlisted for an international award honoring the year's top female athlete. 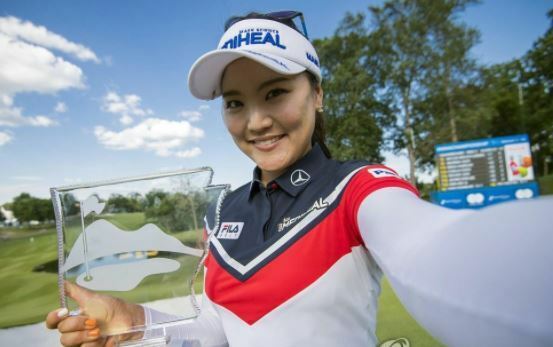 The South Korean golfer is among 10 finalists in individual sports for the Sportswoman of the Year, announced by the U.S.-based Women's Sports Foundation on Thursday. Ryu, a five-time LPGA Tour winner, has been the top-ranked female golfer since June 26. In April, she won the ANA Inspiration for her second career major championship. Ryu will be up against the following athletes: Heather Bergsma (speed skating), Inna Deriglazova (fencing), Anna Gasser (snowboarding), Katie Ledecky (swimming), Tatyana McFadden (Paralympic track and field), Evgenia Medvedeva (figure skating), Becca Meyers (Paralympic swimming), Mikaela Shiffrin (alpine skiing) and Elaine Thompson (track and field). The foundation said the finalists were chosen based on their performances between Aug. 22, 2016, and July 31, 2017. The athlete who receives the highest combined share of a public vote (50 percent of composite) and the foundation's Awards Committee vote (the other 50 percent) will be the winner. Voting will run through Aug. 27, and the winner will be honored at a ceremony on Oct. 18 in New York City. The foundation has been presenting the award since 1993, and former Olympic figure skating champion Kim Yu-na, the 2010 winner, remains the only South Korean to have been honored. There have been four LPGA winners of the award: Juli Inkster (1999), Annika Sorenstam (2004), Lorena Ochoa (2007) and Yani Tseng (2011).